A halfway house is the next vital step in continuing on a journey of recovery. The people, places and things in our lives can easily trigger us to fall back into our old ways. Sometimes our families also need time to heal after the damage we’ve done in our addiction. Whatever your need, it is a daunting experience leaving a primary care facility and re-integrating back into society. It is important now to find a safe, structured environment in which to phase back into the world. Trust in Hope Recovery House provides a safe, secure and structured environment for addicts. We provide guidance and stability on an addict’s path to self-actualisation by introducing routines and getting them involved in a program of sustainable recovery. We aim to provide balance in an addict’s life as they learn to deal with the day-to-day struggles of life. Addiction is a serious disease and can be fatal, so we take an even stricter stance when it comes to the lives of the residence in our care. We aim to guide addicts through example and through our own experience. We seek to serve in a loving and caring way and to inspire change in the lives of the addicts we encounter. Our promise is to always be firm but fair because every addict deserves a second chance. Addiction is a disease. If our disease is left unmanaged we will come out of remission. At Trust in Hope we firmly believe in a spiritual solution to addiction and the only way that we have found to keep addiction at bay on a permanent basis is a daily program of recovery known as the 12 steps. This is probably the most important recovery tool. Residents deal with their disease, their past and their guilt and shame in the step work. The steps provide new hope for addicts and also teach tools for living in our modern society without becoming overwhelmed. There are 12 steps in total. Residents are expected to do step work and it gets check by staff on a weekly basis. A sponsor is an addict that has worked the 12 steps and now gives back by taking addicts in early recovery through the steps. A sponsor acts as a spiritual guide and an anchor in recovery. Every resident must have a sponsor. We can help in finding an appropriate sponsor for each resident. Meetings are where addicts from all over Pretoria get together to share their experience, strength and hope with each other. Meetings are about identification. We believe that one addict can best help and understand another addict. Residents are expected to do 90 meetings in 90 days from their admission and thereafter are required to continue doing a minimum of 5 meetings a week. As addicts we have done nothing but take!!! We have taken opportunities from ourselves, we have taken from our friends and family, we have taken from society. It’s time to give back. Service is simply providing some of your time to helping other addicts find recovery. This can be done in a number of ways but in early recovery, simple service positions are available at meetings to provide a way for addicts to selflessly give back to the fellowship. Residents are expected to get involved in service. A lack of structure and routine is an addict’s worse enemy. Our mandatory timetable helps addict’s to set goals and plan their weeks in advance. This is a tool for orientation and accountability. All residents must do a weekly planner and staff will discuss each resident’s planner with them at the weekly house meeting. 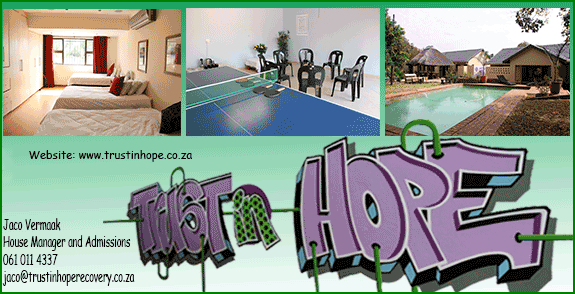 Trust in Hope recovery is located in the eastern suburbs of Pretoria. We have two houses that have been converted into our recovery centre. Each house provides living accommodation for 12 people, one is a men’s residence and the other is for the ladies. Brand new beds and comfortable linens are provided. Each house has a swimming pool, social and relaxing areas, there is a games room, meeting hall and plenty of secure parking. We have two domestic workers from Monday to Thursday and four washing machines available to residents. Safety is a key concern, so we provide 24 hours security via electric fencing and outside CCTV. We also have a live-in night and weekend manager. We provide DSTV, uncapped Wi-Fi and house outings for entertainment and are a dedicated team of passionate recovering addicts. Our menu has been put together by a qualified nutritionist and is on a three week rotational basis to provide food diversity. Breakfast cereals are provided in the morning, breads and jams are available for lunch and a hot cooked meal is prepared Monday to Thursday on the premises by our staff. Fridays we usually braai or get take out, weekend meals and speciality foods are at the residents on cost. We do cater for people who require Halaal meals. Becoming a part of society again as an addict is not easy. We have let down our employers, hurt family and friends and generally don’t know how to act in most situations. But there is hope! From filling out a CV and managing the gaps in our employment record to healing ties with family and friends, we are here to help. We offer our support through all of life’s difficult situations. Whether it’s a court case or suggesting which career paths are suitable, we have the experience needed to point you in the right direction.